What's the difference between: Original Deal, Actual Funding and Actual Deal? MCA Suite takes a three (3) step approach to track cash advance deals. As a result the advance amount, factor and payback amount information may be different during each stage of the merchant cash advance process. The Original Deal Details is the offer made by the Funder or Broker to the merchant. The original deal is not finalized until the deal is funded. In most scenarios, the original deal details information is what appears on the merchant cash advance contract between the funder and the merchant. 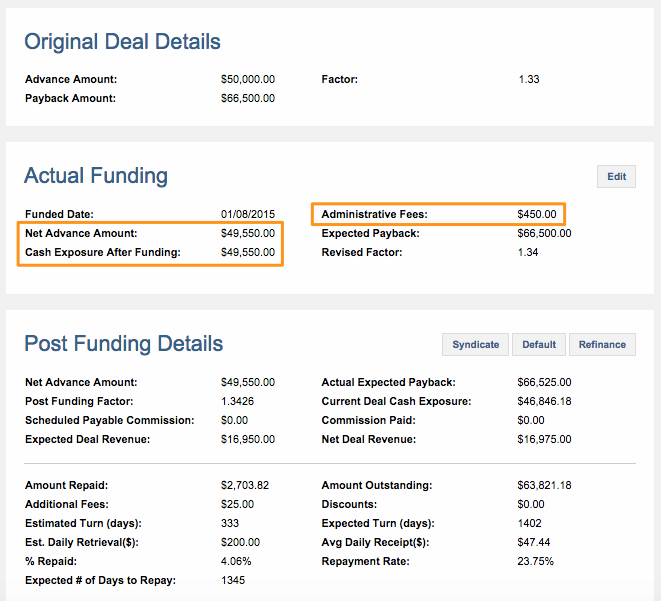 The Actual Funding section takes a snapshot of when the deal is funded (i.e., funded date and related fees). Based on the example below, the Funder funded the merchant on January 8, 2015 and charged $450 in administrative fees which reduced the Advance Amount from the Original Deal Details section. As a result of the administrative fees, a revised factor is calculated using the "Net Advance Amount." The "Cash Exposure After Funding" shows the net amount (cash value) the Funder has funded the merchant. The Post Funding Details section contains activities after the deal has been funded (or during the collection stage). The Post Funding Details section include transactions (manually entered or uploaded), discounts and fees that changes the Actual Expected Payback amount. The below example shows that $2,703.82 has been repaid by the merchant which reduces the amount outstanding to $63,821.18. There's also a $25 fee which increased the Actual Expected Payback amount from the original $65,500 to $65,525.